Want to get maximum muscle growth and fat loss results from your workouts in much less time than typical workouts take? In this new GL-12 exercise video, I reveal how to lift your way lean and strong in a quick but powerful workout progression for your legs (Welcome to Leg Day!). I also cover key mistakes to avoid to prevent injuries as well as tips and recommendations to get the best possible results from your workout. Hey everybody, welcome to the latest installment in our new Dumbbell Workouts for Rapid Fat Loss series. Ok, even if you dread “leg day,” and I’ll be the first to admit I have those days as well, I’m going to give you some news that should have you excited to knock out those lower body workouts. You see, if you want to stimulate more growth hormone and really get that fat loss going, there’s no better bang for your buck than putting your legs to work in the gym. As the largest muscle group on the body, your legs will stimulate more testosterone when strength trained, which is a good thing even for women, as well as more growth hormone. So there’s a reason I strategically designed legs and arms in the same workout together to help you with more fat loss and to help you get that lean, toned, Hollywood look. Check out the Get Lean in 12 team in action in the video above as I walk you through several different leg exercises, including dumbbell squats, goblet squats, dumbbell lunges, and some more advanced leg training with dumbbell exercises. I also provide helpful tips and pointers on proper form to both minimize your chance of injury and maximize your results. 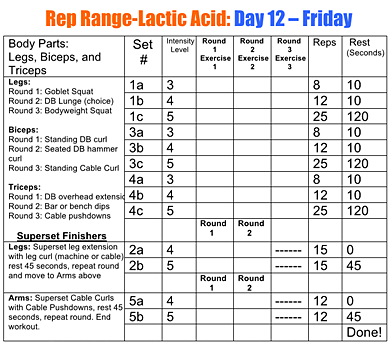 As always, work hard and smart here, and please let me know what you think of the Rep-Range Lactic Acid Workouts and how well they’re working for you.